The garden’s fading. Dry. Few bees. 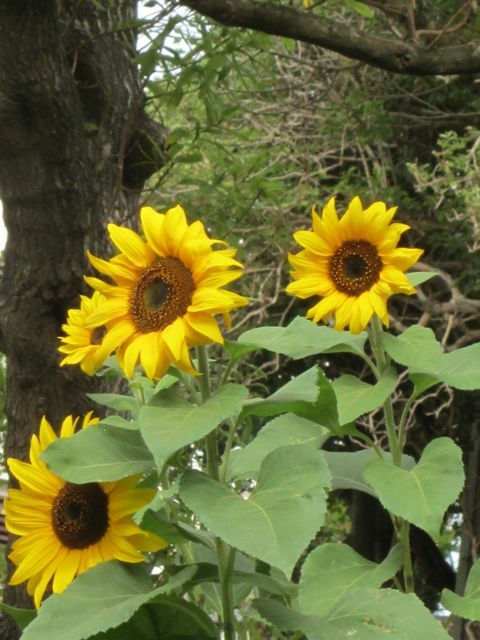 But on the shady side of the public zigzag, a little group of sunflowers. 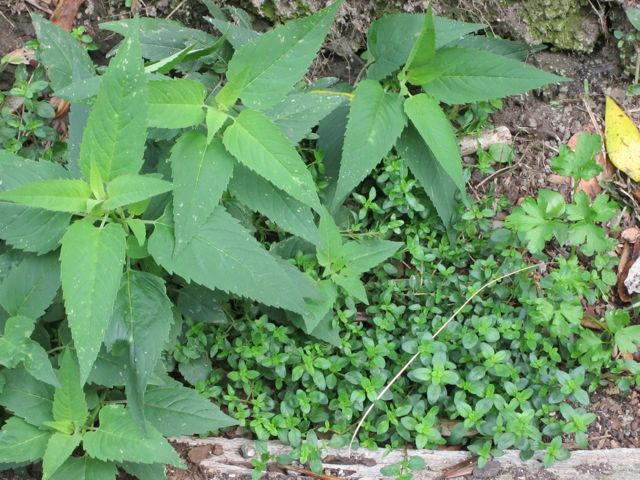 The bergamot and the thyme are growing well out there too, in a shady spot by the path. But not flowering yet. Some hyssop is flowering at last. But it’s not healthy, in the kitchen garden or out on the zigzag. A small insect eats at its leaves I think and it may have needed more water. Can’t see myself gathering enough to make a drink for wintry coughs. 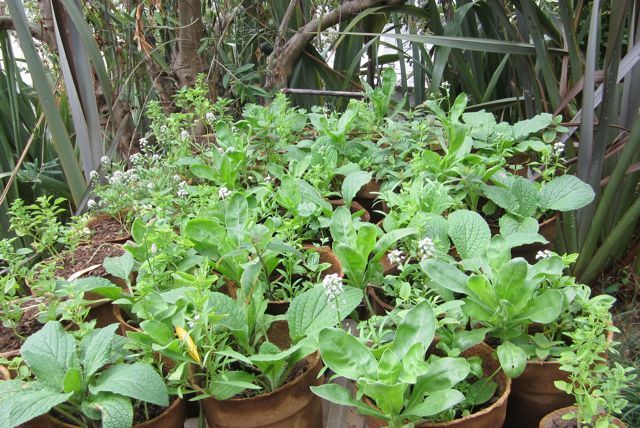 The plants in my pots are healthy though, waiting for their next date at the postponed fair, at the end of the month. One of them’s flown to Nelson. I love it when the plants go somewhere else. They often do much better in their new homes. On the other side of town, a bergamot from an earlier seeding is looking gorgeous. I fell in love with phacelia (purple tansy) before I planted a single seed. Before I’d even seen a phacelia plant. Who knows why? A coup de foudre is often mysterious. And especially for something not yet seen. But if I hadn’t loved phacelia I might have given up. For this year anyway. 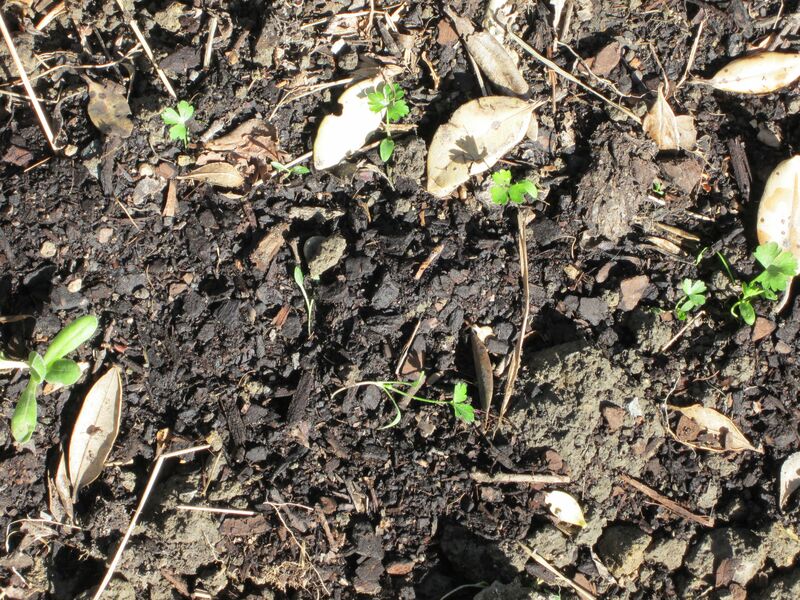 First off, not many phacelia seeds germinated. They drowned easily as tiny seedlings too. 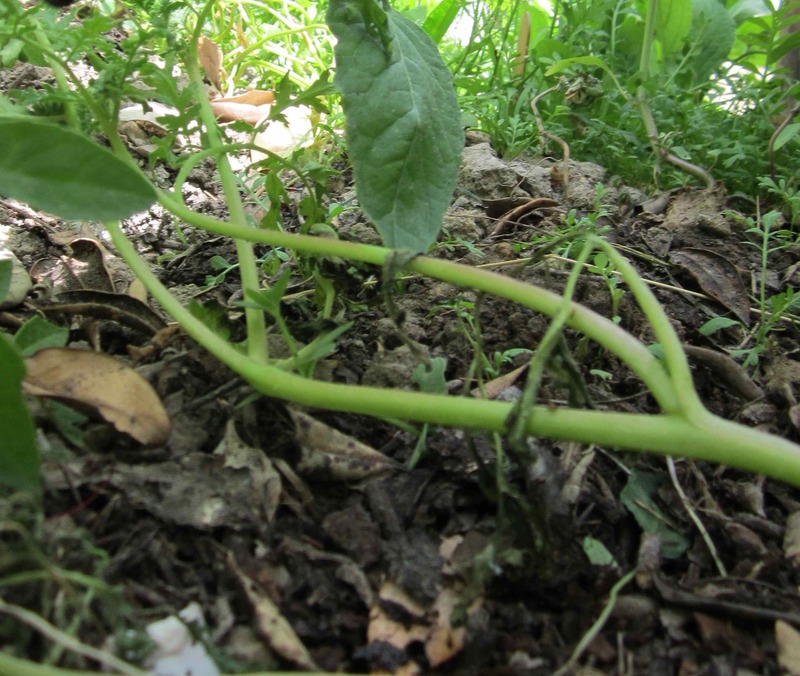 With so many seedlings to water – see early posts – I was sometimes a little careless. 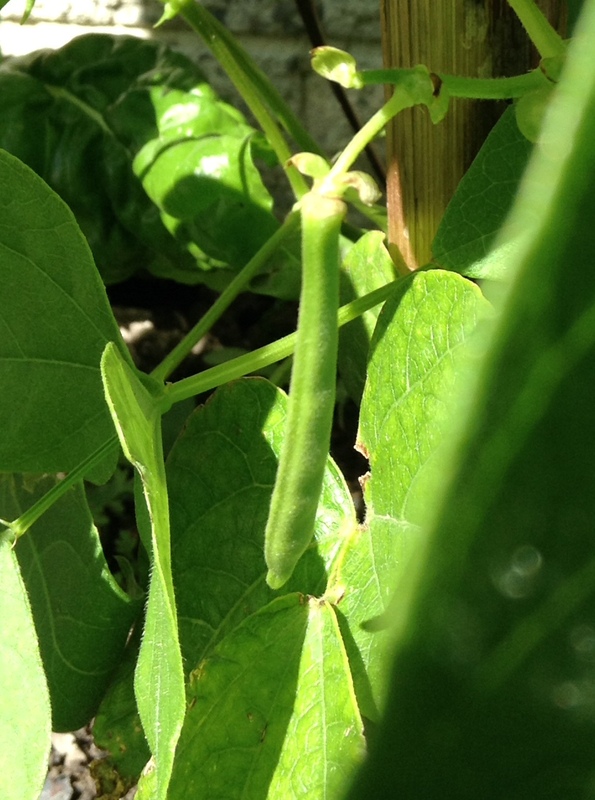 Eventually I planted half a dozen in the vegetable garden where I could keep a close eye on them. 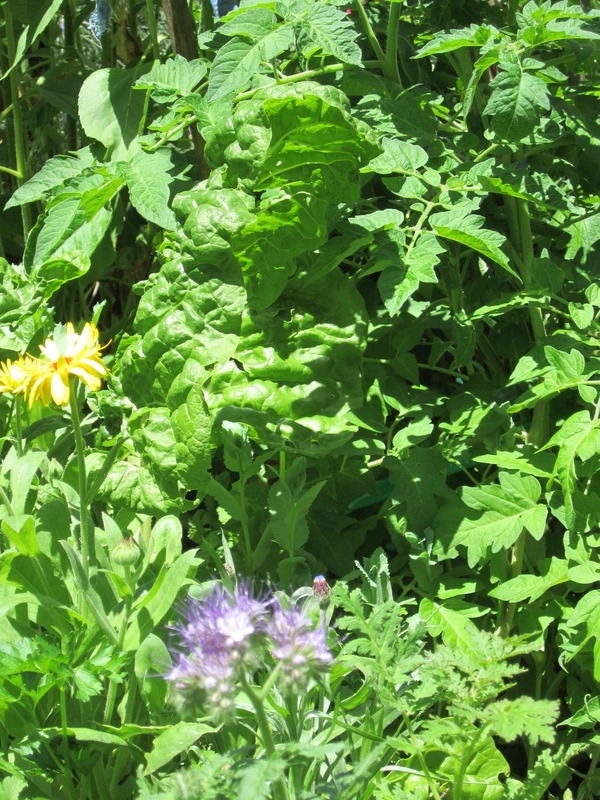 And four in the tomato patch on the zigzag, where the nearby hyssop, parsley and bergamot flourished. But not the phacelias. 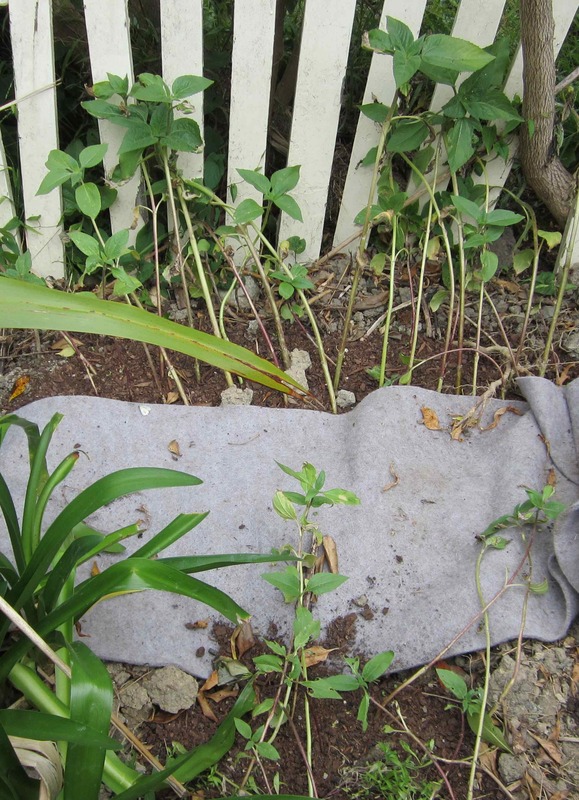 Birds saw a space with fresh compost and scratched up the plants. None of the others, in more robust groupings, only the phacelias. I rescued what I could. And I covered them and their rescue Black From Tula tomato neighbours with this chicken wire cage (the net was in use in the vegetable garden). The phacelias in the vegetable garden flourished and flowered. Even the one that I somehow broke, and mended with gaffer tape. Then the zigzag phacelia looked about to flower and the Black From Tulas were growing like crazy. So a couple of days ago, with great care not to catch the plants in the chicken wire, I lifted it off. 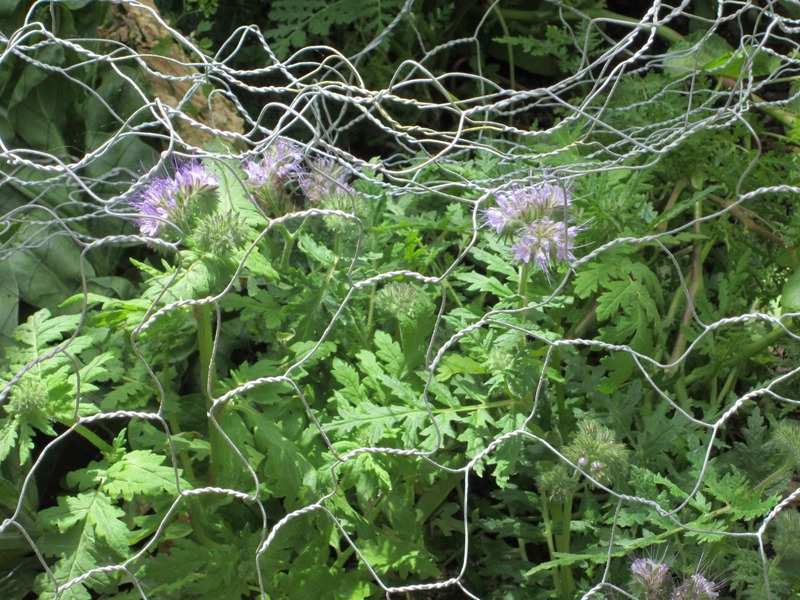 Caught the phacelia somehow. And ripped it RIGHT OUT. Broken roots. A nasty shock. For both of us. I put it back, with more compost. And now I run to and fro to water it twice a day. Sometimes with compost-tea in the watering-can water. It looks as though some stalks have died, but one is coming back (top left). Maybe two. Whew. My garden is overflowing. Flowers and vegetables packed in. Still too few bees. And all of them bumbles. More than ever, I regret my failure to transplant all the sunflowers to the zigzag. They’re now taking up far too much space and overshadowing tomatoes and herbs, the bee-loved plants that I hope will soon flower . A couple of days ago I saw the borage and parsley growing and seeding like crazy and decided to make space by ripping out all the borages. Two advantages. More space. 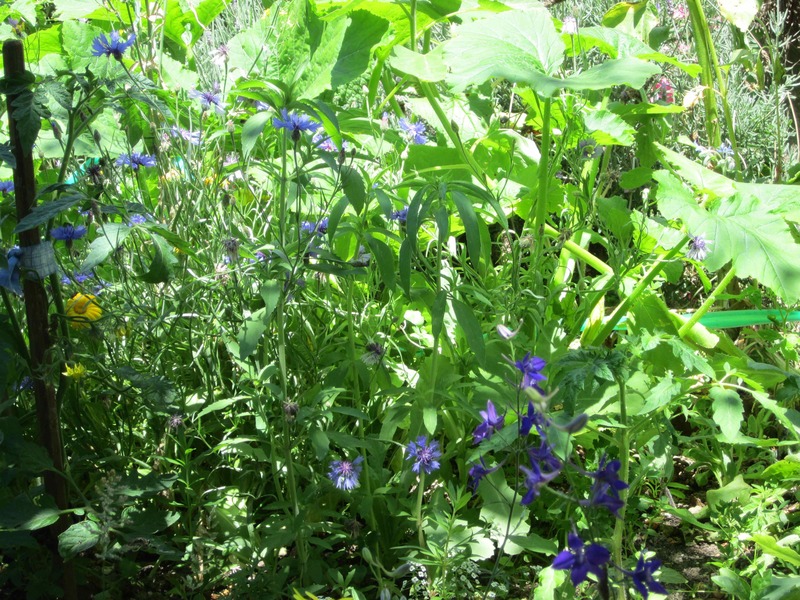 And I could observe what (bumble) bees choose when borage isn’t immediately available. 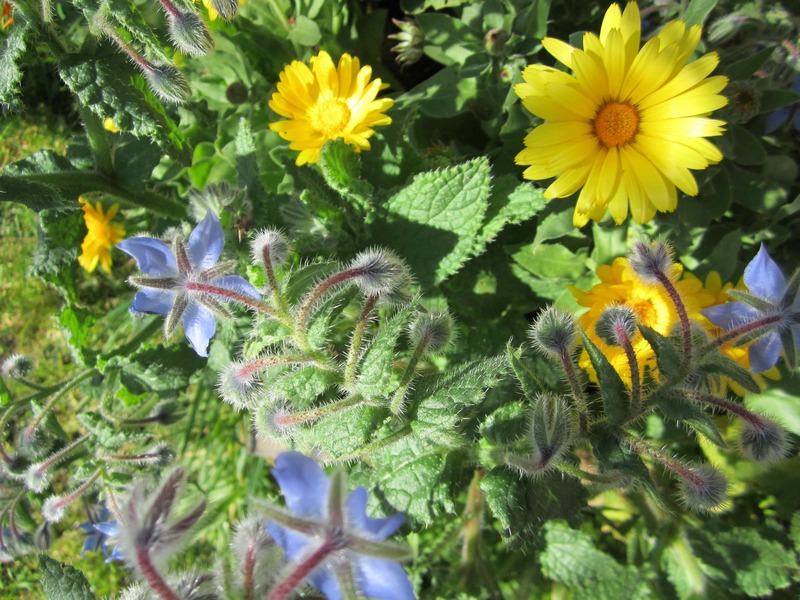 No guilt involved– the borage is great in the weed bins and there are already tiny borage plants everywhere for the not-too-distant future. And yes! 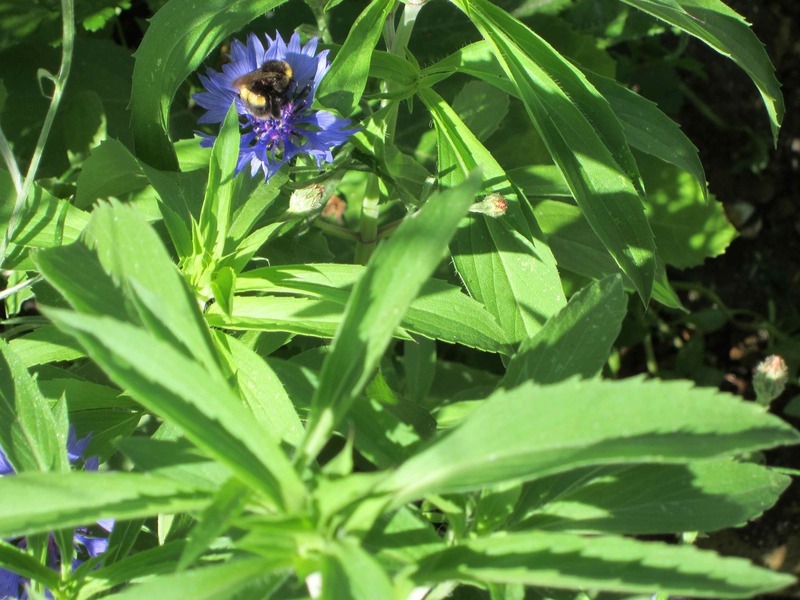 The bees made for the other blue plants– larkspur and cornflowers. I saw one briefly on the phacelia but didn’t have time to catch a pic. 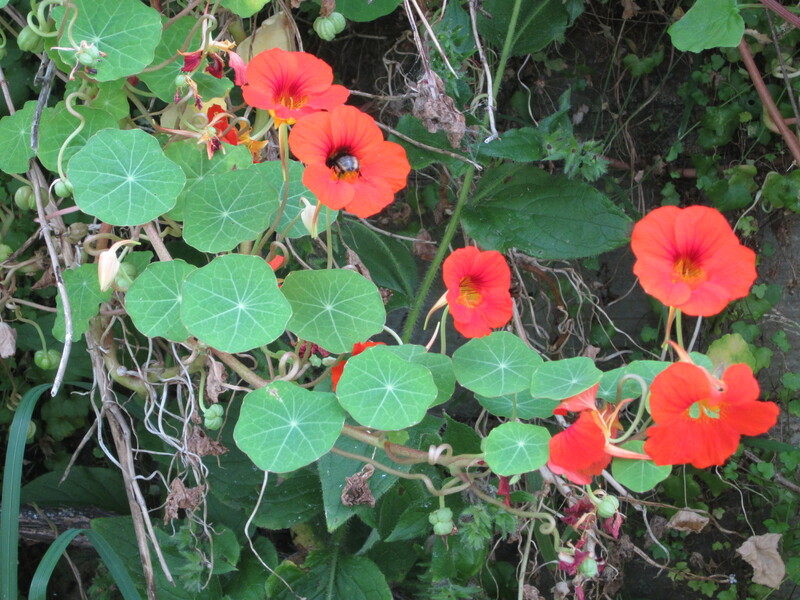 I even saw a bee among the nasturtiums. 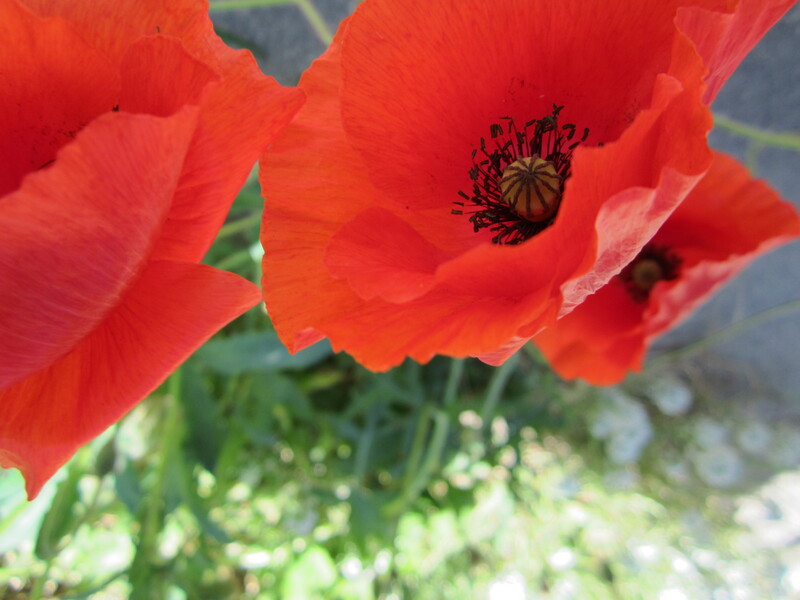 Meanwhile, on the other side of the house the poppies are going for it. And the bees love them. But I’ve noticed that once the fluffy bits around the seed head in the poppy centres disappear (often on the very day the poppy flowers– is it the wind, the bees, or just a normal rapid poppy change?) 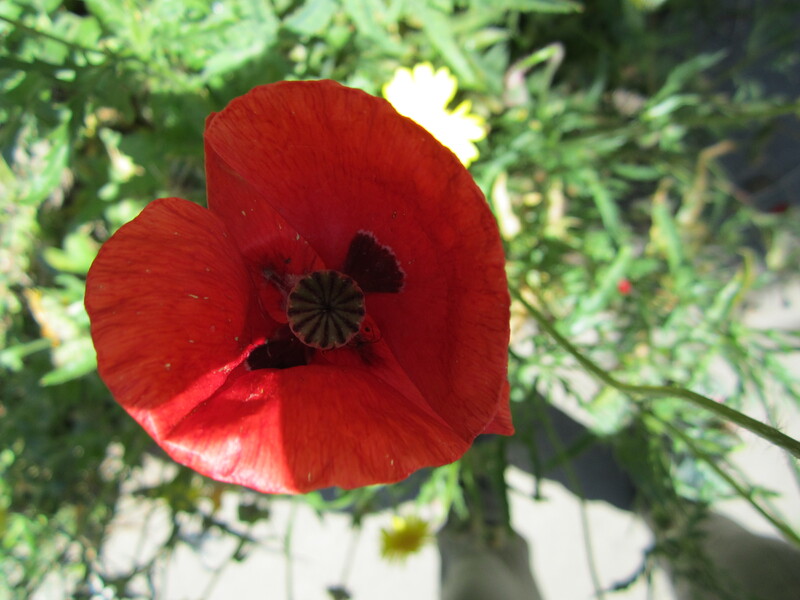 the bees avoid those poppies. The fluffy bits must carry the pollen. It makes sense. I had NO IDEA that growing beeloved flowers would stimulate so many conversations. Not always about bees. On the zigzag the conversations are with passersby. Some I know. Some I don’t. Sometimes I’m happy to chat. Sometimes I’m not. 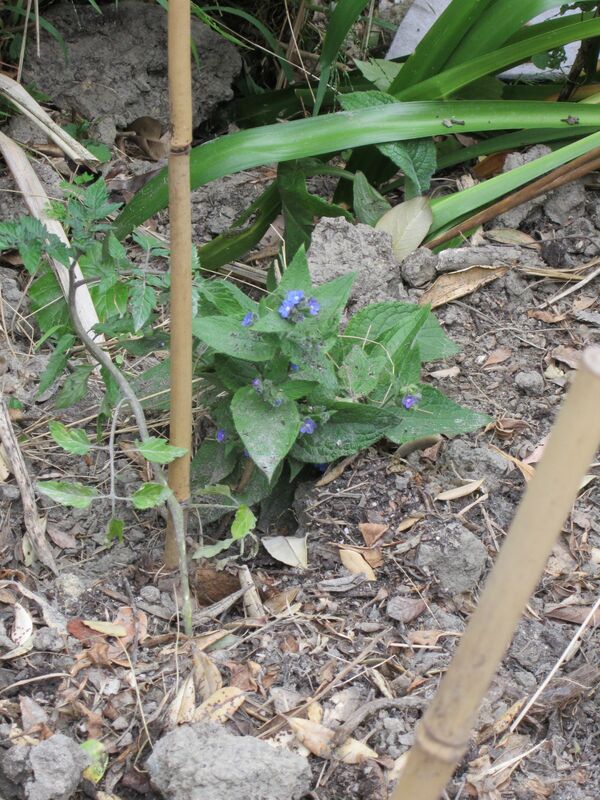 And I loved it when a strong and chatty house guest dug a trench for me, in a clayey zigzag spot, for the sunflowers which I should’ve transplanted weeks ago. You can see they’re not that happy, a week later. But today it’s raining steadily. That may help. I left the rest of the group in my back garden where they flourish. I loved it on the zigzag when an old acquaintance passed by and said he’d like a parsley patch. So when the sunflowers were in, in front of them I planted a group of volunteer tomatoes a neighbour donated, some Black From Tula toms that I’d left far too long in their pots, some phacelia that the birds – or a cat frustrated by the netting on the backyard garden – immediately scratched up. 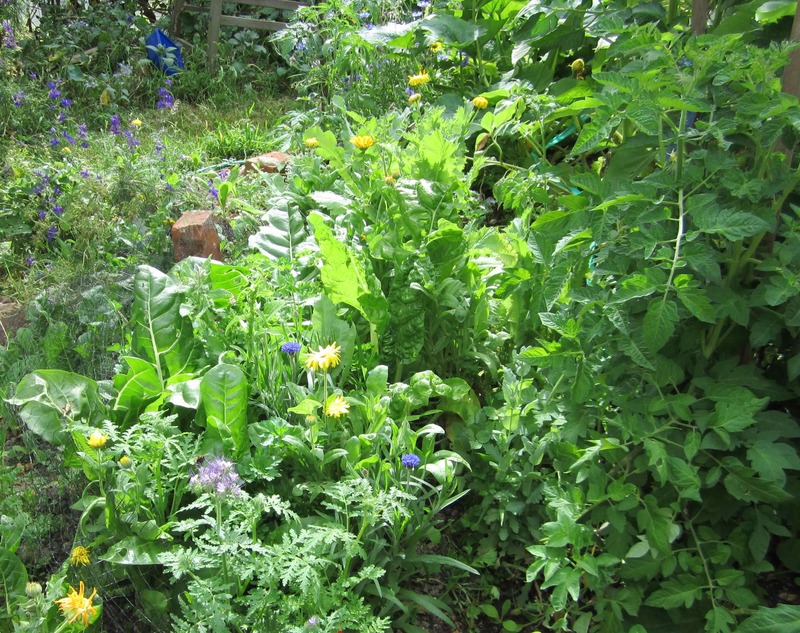 And at the very front, next to the zigzag path, a little patch of small parsleys and a few calendulas. I also have conversations with people who are growing tiny plants from here, at their place. 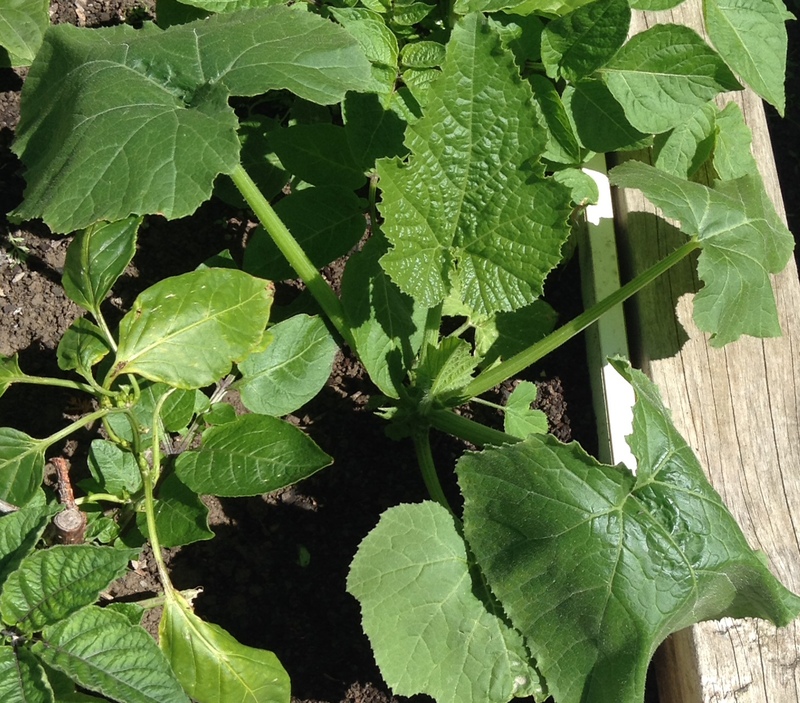 I’ve lost track of what some of these plants are… Also, I tried three of the toms hanging from buckets but I didn’t get their roots in far enough so had to replant them more normally. I looked at this herb, growing on a sunny windowsill I’m familiar with. It’s grown more quickly than most of my own herbs sown from the same seeds at the same time. But all their labels blew away when they were seedlings. What is it? I know it’s not thyme. 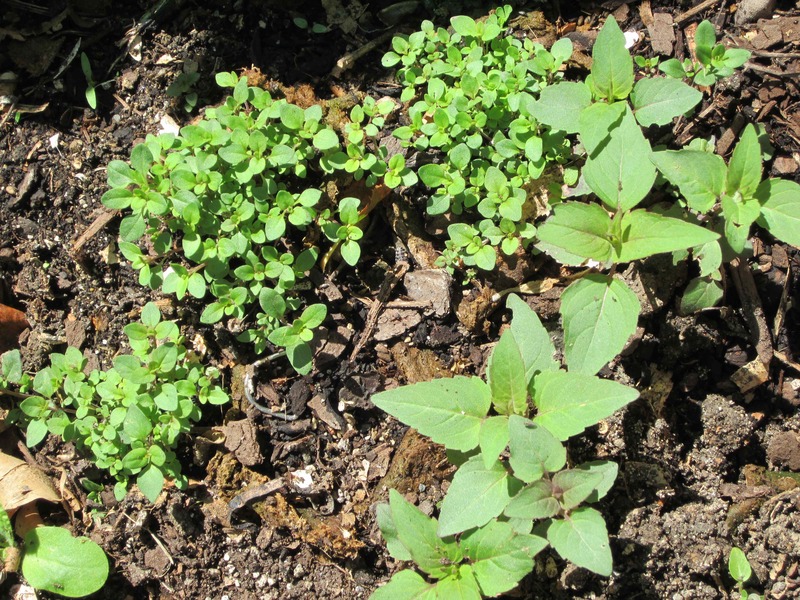 There are thyme, hyssop and bergamot babies in my garden. 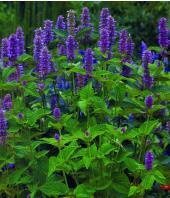 I sowed two kinds of bergamot, bergamot bee balm and bergamot lemon but they and the hyssop are new to me. Thyme’s the only one I’m sure of, by look and smell and taste. 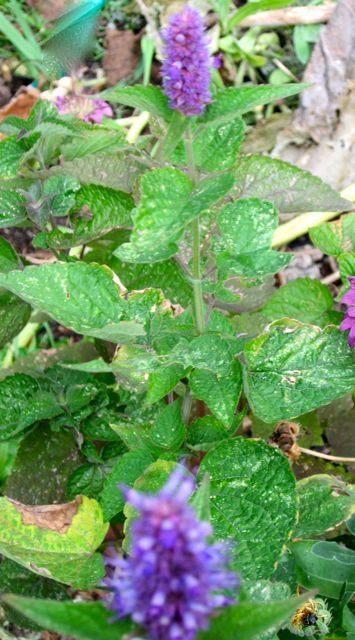 Is that plant on the windowsill anise hyssop? Maybe. 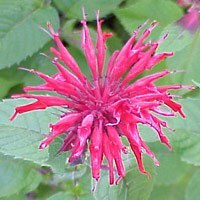 Like hyssop, bergamot is an aromatic perennial herb. 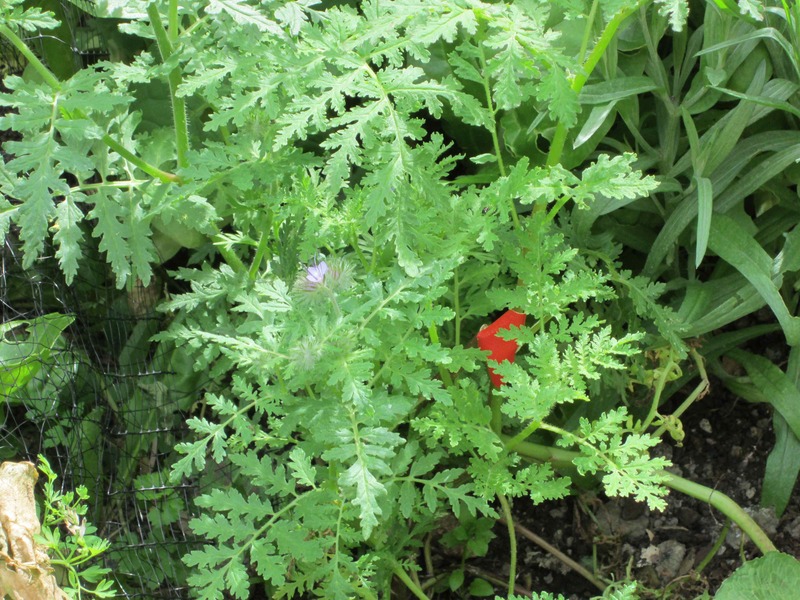 It’s also thought to be a good companion to tomato plants. So I hope those little plants in the sunny window are bergamot and will join the now-flourishing tomato plants in my friends’ also-sunny garden. And that they will flower soon and feed many bees. And lots of scarlet runner flowers. I gave her a Florence ribbed courgette too. Like mine, it’s looking good. Well on the way. And as for the bees, they’re regularly on this little path leading from my place to the zigzag, more bumbles than honey bees. AND, for the first time, I’ve seen a (bumble) bee on the zigzag. It alighted on this forget-me-not, near the new tomato plants. I worry about bees. 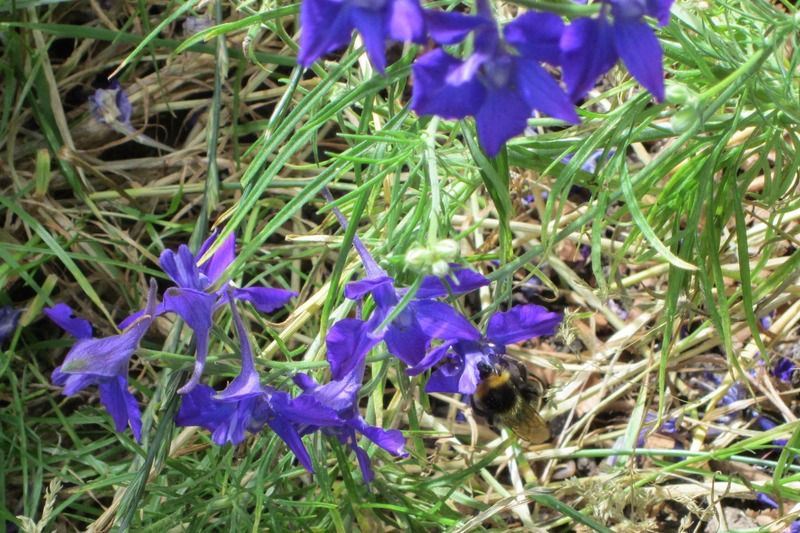 In my garden, a wild bee is a rarity. Each year there are fewer honey bees and there are more and more bumble bees, which tend to damage the blossom on my fruit trees and beans. When I learned that most flowering plants are grown from seeds treated with neonicotinoids, neuro-active insecticides that reach flowers and harm foraging bees, I decided to grow more flowering plants. Bee-loved and SAFE, from seeds without neonicotinoids, where possible heritage seeds and open pollinated seeds that will then provide more ‘safe’ seeds and plants. To distribute as widely as possible. Let me know if you’d like some. I already have Calendula and Borage. Alyssum. Poppies. Evening Primrose. Italian Parsley and other flowering herbs-to-cook-with. All self sown in my garden, which has been spray-free for almost 35 years. And some plants from the organic shop. Lavender. Rosemary. 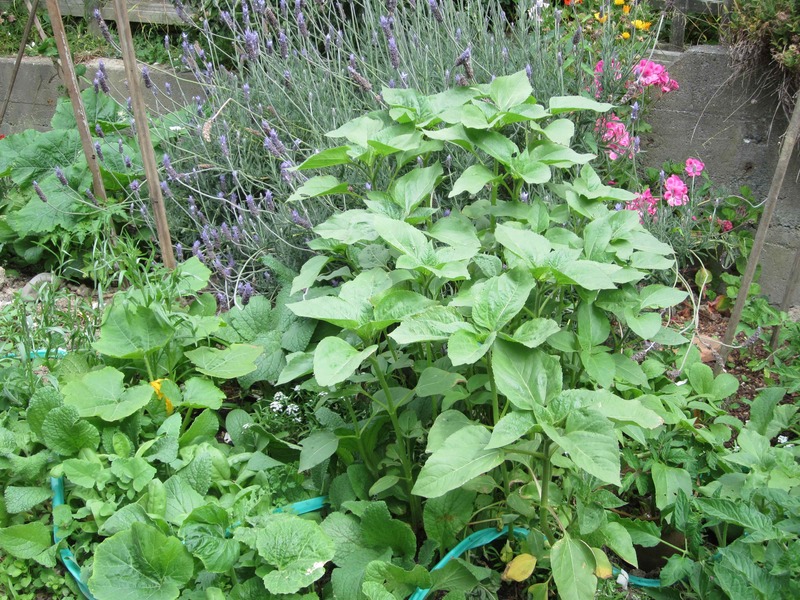 But now I’m adding others, from Koanga Institute and King’s Seeds– Peony Black Poppy, Hyssop, Wild Thyme, Bee Balm Bergamot, Anise Hyssop, Lemon Bergamot, Cornflowers. My Sunflower seeds from last year have already sprouted. And my mates are helping me. 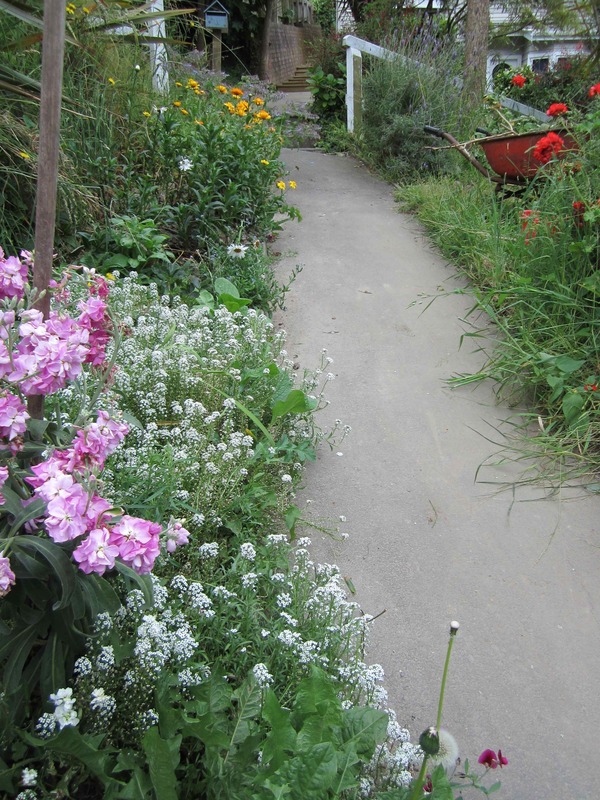 They live on the Kapiti Coast, where it’s warmer and their garden gets more sun. 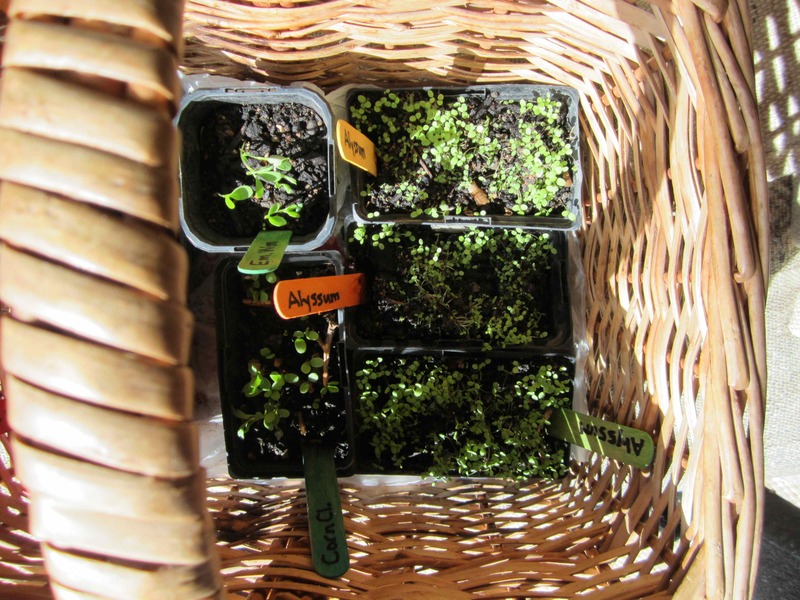 Yesterday, one mate brought the first batch of seedlings into town. I met them at the station and it felt like meeting a new baby. 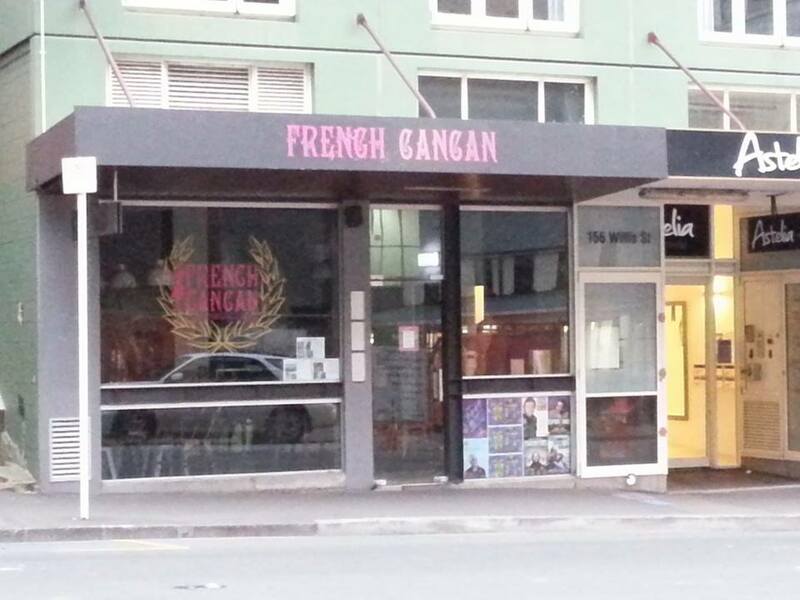 After that, to celebrate, we went to French Can Can, the best-ever Wellington cafe for French savouries and cakes. The boss, Eric Hauser, has TWO Michelin stars. And it shows. One of us had a quiche and a mille-feuille with coffee, the other an amazing little chocolate friand-like cake, filled with a delicious gooey chocolate and raspberry sauce, with a pot of tea. The tea came with a three minute tea timer, so the tea drinker could be sure to get some anti-oxidants. Then I took the baby plants home to meet the tomato seedlings. Welcome to the world, baby plants!